One of this weekend’s treats was visiting the Cultural Revolution display in the WM ground floor exhibition room. Having enjoyed an exhibition of Soviet propaganda art at the Tate and a propaganda show at the British Library I suspected this would be my cup of (green) tea. That “W00t” moment when your team wins. The exhibition (touring as part of the Ashmoleam museum of Oxford) covers a 10 year period after the communist revolution where all art was legally required to serve the state. There is a lot of celebrating workers, soldier and peasants with references to Chairman Mao’s work. As well as posters there are some paper cut outs and my favourite, a collection of matchboxes with reminders on how to be a good citizen. The exhibition is on until the 27th May and is free. While you’re there drop into the little room behind the canteen for a little exhibition about the Haiku Adventure videogame being developed in North London by Small Island Games. It really fits in as SIG discuss in videos and examples how their game was inspired by Japanese wood prints in the same way William Morris was inspired by historical British design. While having a stroll past the WMG I noticed a new exhibition was on, ‘Weaving New Worlds’. The recent exhibition about Morris’ daughter was good so I nipped in for a look. It’s a collection for art by women weavers around the world. Some political, some personal, all varied. While it didn’t grab me personally the breadth of this small show, both thematically and geographically, is impressive. Tapestry is a rare art medium; well done to the WMG for giving it more exposure. The ‘Be Magnificent’ exhibition is the latest in what has been a series of fascinating shows at the William Morris Gallery. This one is about the Walthamstow School of Art’s history and famous teachers and pupils. There are many references to its most famous student, Ian Dury, who ironically went on to success for his music rather than his paintings. There are study sketches as well as final pieces and clothes and fabric prints from the fashion students. The show extends from the ground floor exhibition space so don’t miss the extras; pieces in the dining room, the first floor landing and definitely do not miss the wonderful 10 minute film in a first floor side room of interviews with former students and teachers. It’s a warm collection of reminiscences from people who later realised how fortunate they were in having such a unique creative incubator to awaken their talents. Entry is free. On until September 10th. So the other day I was contacted by local Gerald O’Connell after we chatted in the comments on a post. He is a local artist and his latest project is ‘Human Street Furniture‘. It’s a collection of portraits of local community members who would not normally be represented in the media. Go take a look via the link. Also read his blog for insight into Gerald’s creative process. I’ve never had any artistic capability myself but I love how the stow has a very rich seam of talent running through it. 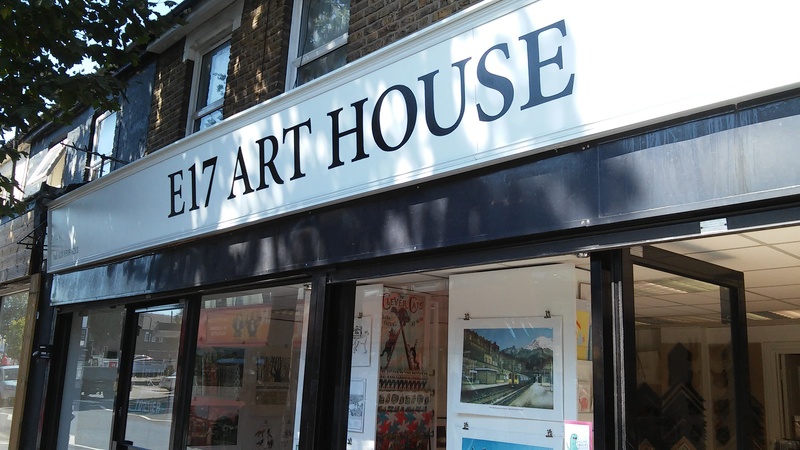 Well the other week Elaine from E17 Art House left a comment here letting me know about their new picture framing and gift shop on Hoe Street, near a couple of places I’d been writing about. After a visit to Indulgence for lunch my partner and I dropped around for a visit. They sell a large range of gifts like soap and ceramics. I was most interested in their small selection of stationery items. I found some smart but lewd notebooks which I bought as a fun gift for a friend. I was tempted by nice pencil cases; maybe next time. 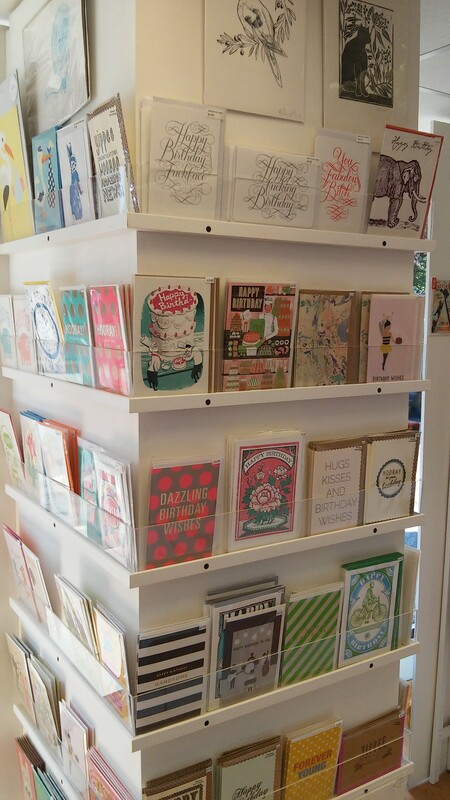 They have a selection of cards for many occasions and wrapping paper. I introduced myself and had a lovely chat with Elaine. Her colleague did a free gift wrap on the notebooks I’d bought tied with ribbon and was very well done. Obviously there is the picture framing. I have a couple of prints I want framing nicely and I intend to bring them along to E17 Art House. With the stow’s artistic community I can see the folks here getting a lot of custom, and being on the walk from Central to the William Morris Gallery will hopefully see visitors buying gifts and art prints there. 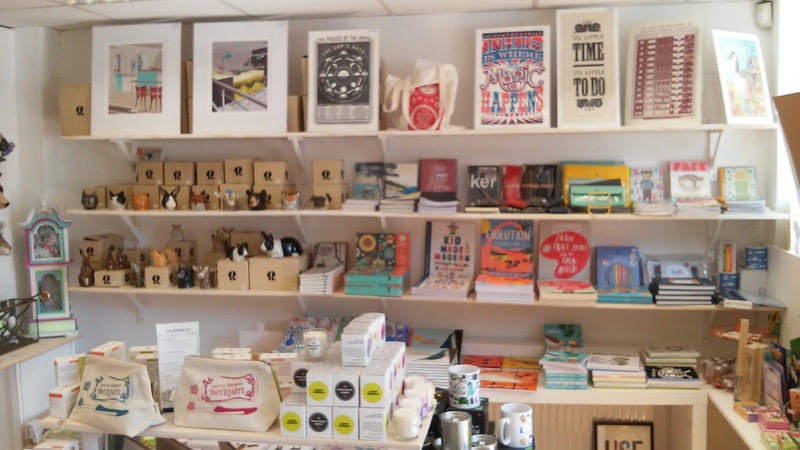 I’m really glad to see yet another quality shop open near the Bell corner; it is becoming a nexus of cool that isn’t the Village. Drop in and have a look. They are at 54-56 Hoe Street. A very smart sign. It’s nice to see North Hoe street getting some love. So lots of people have already written about the night, the result and how the UCKG bussed in loads of supporters who then crammed the public seats and attempted to intimidate the planning committee. As I was one of the many left outside I joined in the chanting and community spirit that was in abundance. We crowded around smart phones following the twitter news from inside. We enjoyed the rousing bagpipe music. And we celebrated heartily after the result. I hear the Rose and Crown was heaving with winning spirit. I was in The Village with the rest of the McGuffins, Bill and John having a much needed relaxing drink after a very stressful day. Apparently the UCKG plan to appeal but really have no ground to do so. I suspect they’ll try what they’ve just done – change the planning application and ‘dress it up’ as anything other than the change of use which they want. But their lies were exposed at Catford and what they did there has come back to bite them. Viva Awesomestow and its fighting spirit! So a few weeks ago I was walking down Forest road and I noticed one of the shops opposite the Pretoria junction had been repainted, with the words ‘Tokarska Gallery’ on it. While closed I had a peek through the windows and saw that indeed some noble nutcase had opened a venue for art on Foresat road! A quick google revealed that the gallery had been opened by an artist who had once lived locally, Nadiya Pavliv-Tokarska. Last week I had a chance to drop in and view the first exhibition of her own work. Most of her work consists of fascinating portraits of London streets, mostly around Liverpool Street. They seem to quite inpressionistic and have a photo like quality of not being quite perfect (like slightly out-of-focuse street furniture in the foreground). There were some other works such as one of her studio. I’m very surprised at the location. It is very near Blackhorse Road station but has no free parking around it. Chatting to the lady there (the director Alexandria Kenna, according to her business card) I found they had a four year lease. Hopefully this got them a very cheap deal making the business sustainable. Maybe this makes the venue more valuable than being on Hoe Street or the unfashionable bottom end of the high street? Regardless, it’s well worth dropping in for a view if you’re in the area. Pictures can be seen on their website.